Did you grow up in the South? 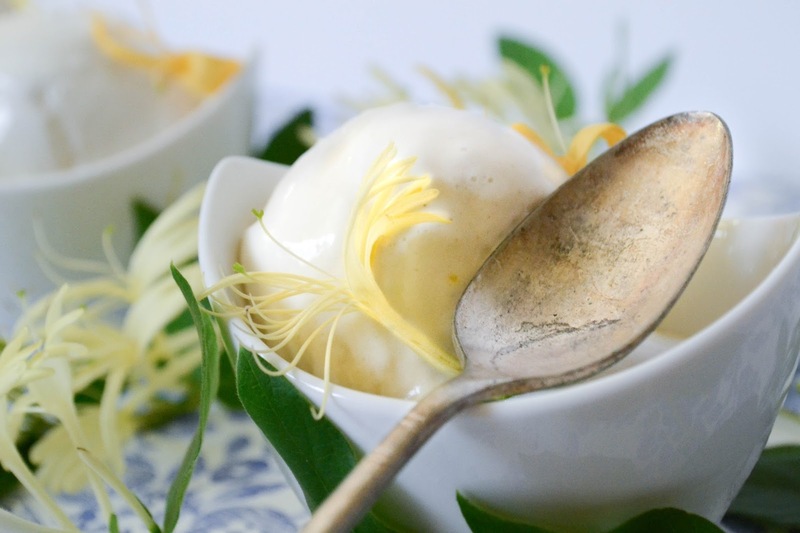 I did, though I never dreamed honeysuckle ice cream could exist. I grew up with those barefoot, firefly summers. With ice-cold well water and games of four-square in the middle of my neighborhood street. I would get tough feet every summer, able to run on asphalt and rough aggregate with minimal discomfort. It wasn't a terribly unique childhood, but it was a fantastic one and summer was the prime part. Though autumn now has my deepest affection, there is still a freedom and childlike happiness that comes with the long golden days of late summer. I don't know why, but my siblings and I spent a lot of time as kids trying to figure out which plants were edible and which were not. Wood sorrel (we called it "lemon grass"), clover, and "watermelon grass" were great "snacks." But we liked nothing so well as finding a big, glorious patch of honeysuckle blossoms to raid. I'm still shocked to this day when I find somebody who never sucked the nectar from the base of honey-suckle flowers. We'd do serious damage to a crop of honeysuckle if we ever found one, carefully plucking off the golden blossoms before the white, carefully stripping out the center "string" and licking off the solitary bead of nectar. Long before I knew what ambrosia actually was, I determined that this was the food and drink of gods. And really, was I so wrong? Find one Southern kid who doesn't have at least the scent of honeysuckle playing like a soundtrack in the back of their summer memories. Even now when I drive down the highway on a summer night with my windows down, the prolific, bewitching scent of a night drive wafts through the windows: exhaust, freshly mowed grass...and honeysuckle. 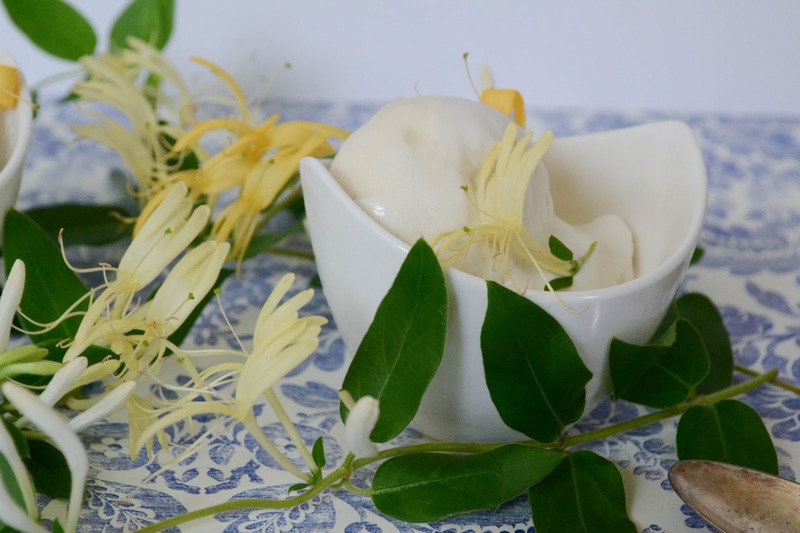 So when I thought about making honeysuckle tea, the idea quickly morphed into a question: could I make honeysuckle ice cream? I wanted it to be sweetened with honey rather than refined sugar, with the flavor of the honeysuckle blossoms shining just above the "promised land" tones of milk and honey. Of course I'm always impatient to taste food experiments so though first batch was delicious, the honeysuckle flavor didn't come across as neatly as I'd have liked due to trying to short-cut the infusion process. 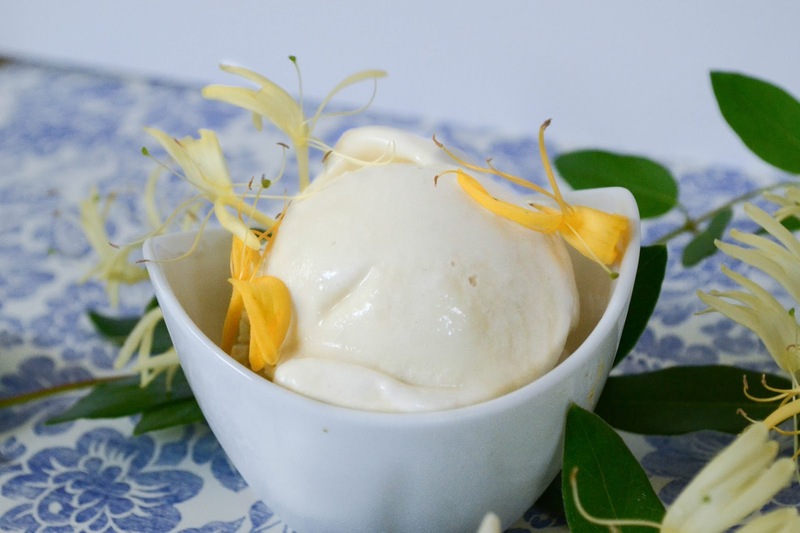 I exercised patience with the second batch of honeysuckle ice cream, letting the cream base chill (with the honeysuckle blossoms intact) overnight in the fridge. This caused the most glorious honeysuckle flavor to stick around. 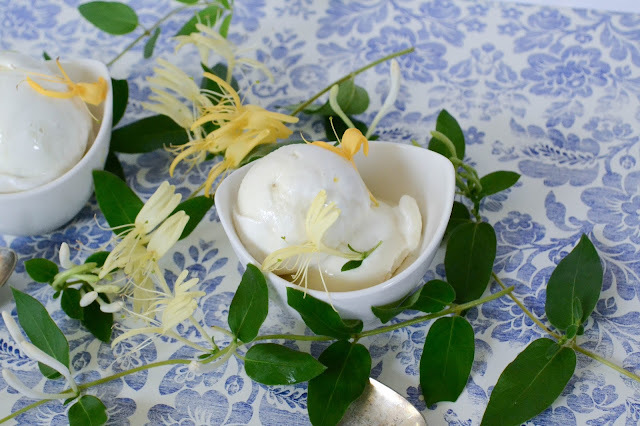 When churned, it became the happiest, most elegant summer dessert imaginable. So here's what I hope you can do: take a walk in the evening, follow your nose to a honeysuckle bush (I robbed an abandoned house for mine), strip off about two cups of the blossoms, and start working on this ice-cream version of an iconic childhood memory. Promise it'll make you smile. I hope the honeysuckle is still blossoming in October (hey, it's Southern Virginia...I can dream) when we harvest the honey from our hives so I can make this again with our own honey! 1.) In a medium saucepan combine the milk, heavy cream, and honey. Heat until well combined and warmed through. Remove from heat and toss in the honeysuckle blossoms to steep. Stir in vanilla and the pinch of salt. 2.) Chill this base for at least 8 hours, or overnight. I know you'll want to short-cut, but this step is crucial to getting that intense honeysuckle flavor you're in this for! 3.) The next morning: beat egg white until stiff. Gently fold into the egg yolk, then fold this into the (strained) cream base. Churn according to your machine's instructions, spread into a freezer-safe container, and allow to freeze deeply for 2-4 hours. This is a soft ice cream so don't worry about trying to get a super hard freeze. It will be whippy and slightly more sturdy than soft-serve. Yum. Our honeysuckle (the invading Japanese kind) is gone for this year, but I'd love to try this. Are all forms of honeysuckle edible?